Syrian President says his country's relations with Iran and its presence in Syria are non-negotiable. Syrian President Bashar Al-Assad said on Wednesday that relations with Iran and its presence in Syria were non-negotiable. 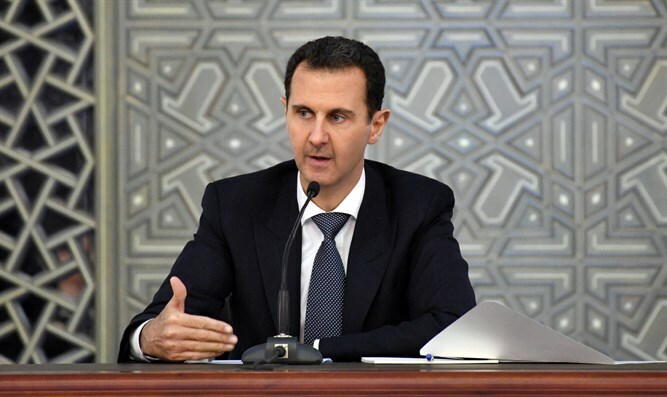 Speaking with the Iranian-based Al Alam television network, Assad added that he would not object to the establishment of a permanent Iranian military base within his country's borders if such a base is necessary. The comments come as speculation has mounted in recent weeks regarding a possible Iranian pullout from Syria as Israel and Russia’s rhetoric on the matter has increasingly converged. Russia declared two weeks ago that all non-Syrian forces operating on the Syrian side of the Israel-Syria frontier should be removed. Last week, the London-based Syrian Observatory for Human Rights said Iranian forces were preparing to withdraw from southern Syria, pulling back away from the Israeli border. According to the organization, Iranian Revolutionary Guards forces and Iranian-backed Shiite groups, including the Hezbollah terror organization, are preparing for a mass-withdrawal from the border area. Israel has long demanded the withdrawal of Iranian forces from Syria and Russia's intervention in recent days has been interpreted as a win for Israel's diplomatic efforts. Assad, however, told Al Alam that "there is nothing to prevent the existence of these bases as long as Iran is an ally, as is Russia." The Syrian President affirmed his country’s relationship with Iran and vowed not to bow to international pressure. "The Syrian-Iranian relationship is a strategic relationship, not subject to settlement in the south or in the north...and Syria and Iran will not place this relationship in the international political bazaar to be bargained," said Assad. Iran has never hidden the fact that it is a strong supporter of Syrian President Bashar Al-Assad and has been providing him with both financial aid and military advisors against a range of opposing forces.